What better way to celebrate V8 day of Engine Week than with a big ‘Murican 427? You all know how the story goes. Carroll Shelby stuffs a big America V8 into a small British roadster and the rest is history. There have been countless numbers of replicas, but only a handful of cars were the real deal. Those now sell in the million dollar range. 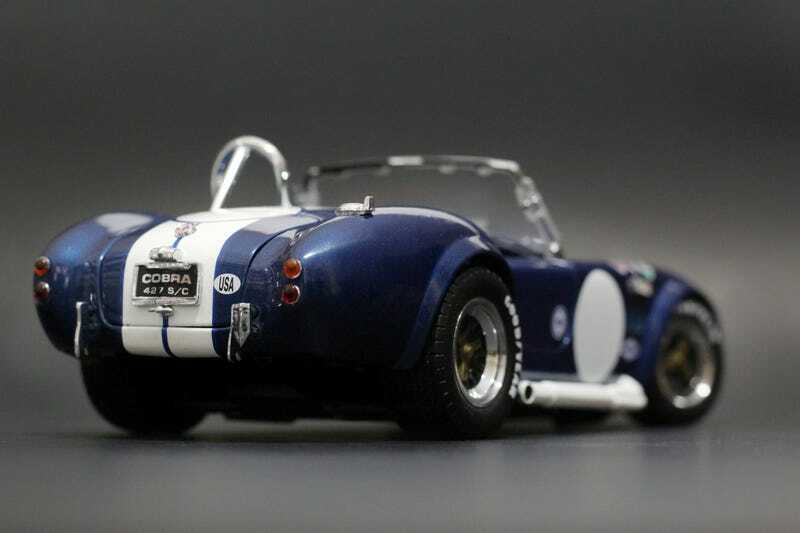 This is the Kyosho 1:18 model of the legendary Shelby Cobra 427 S/C Roadster. It comes in all kinds of flavors: silver, red, dark green... but we all know the best is blue with white stripes. I took my time tracking this one down and eventually won an auction for around $45 for this bad boy. There are plenty of other model makers’ Cobra’s too, like Schuco, Road Legends, Ertl, and Shelby Collectibles. If you want a Cobra, I highly recommend this one, but make sure you hold out for a good deal to pop up. There are two newer Kyosho releases, but those retail for over $100. There are also plenty of sellers on ebay who think these are made of 24k gold. Patience is key, deals are out there to find . Looks like Enginerrrrrrrr knows what’s up too!